Well, not really a competition, more of a give-away to be honest! 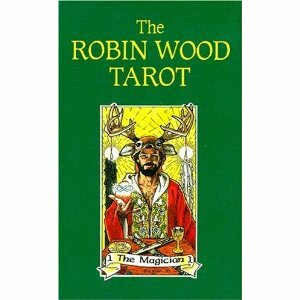 I’ve got a copy of the perennially popular Robin Wood Tarot to give away! Although the box has been opened, the deck inside is still shrink-wrapped. It is a duplicate of a deck that I already own (the curse of browsing Amazon’s Tarot stock with a glass of red wine in one hand and the mouse in the other lol!). I’m happy to post it to a new home, anywhere in the world! To stand a chance of winning, all you have to do is click to become a follower (yes, existing followers will be included in the draw!) and also to comment on one of the blog posts that I’ve made here. Any comment made on any blog post from Wednesday 4 April will count towards winning. Give away closes on 30 April. So – if you like the blog, comment on a blog post – The Robin Wood Tarot could be yours! I wore this deck out three times I liked it so much. oooh reading the replies…Helen…why stickers? Maybe she means glittery stickers?! No roody doody in my copy lol! You're in the draw btw! Thank you for the generosity. I am already a follower and I often comment on your posts about swords but I keep getting some messed up error. I succeeded in posting on Queen of Wands though and also the Page of Swords. Now a happy follower! I posted a comment about your Swords Court (actually just the Queen), but because I'm a technomoron I had to post as "Anonymous". Hoping that I can be entered for the drawing anyway. Thank you for your kind generosity in offering this deck! Well, as long as I only have one Amonymous, it can be YOU, and if you win the deck, I'll just have to hope that I can find you again to get your details! It is lovely and now you're in the draw to receive a copy! Yer in the draw for the deck! Of course, I am a faithful follower! At least I think I am…if I receive the emails, am I a follower? Love the blogs! That's a lovely deck and one I still don't have. Lovely idea Alison, thanks! Well, that's you included in the draw for it now! Which cards would you put stickers over, Helen? It all looks quite inoffensive to me? Nooooooooooooooooo don't ruin it for me! Same as Arwen. Love your blog, got the Robin Wood and love it, too (my first deck!). And it's still in good shape. Great contest idea, though. Hello there! What kind of 'follow' counts? I've syndicated your feed onto livejournal here: http://courtcardblog.livejournal.com/ but not sure if that counts? Whee! You know I follow. 🙂 But don't put me in the contest. I love this deck and have it already. However, if you are going to wine-shop again, you need another Wildwood. Just sayin'. Maybe I do need another one! I am thinking of getting another Druidcraft to trim down, just to see whether I like it or not!